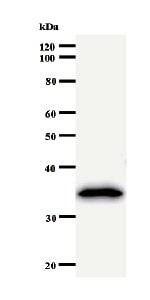 ab50621 was purified from culture supernatant of hybridoma cultured in a medium containing bovine IgG-depleted (approximately 95%) fetal bovine serum. Our Abpromise guarantee covers the use of ab50621 in the following tested applications. WB 1/100. Detects a band of approximately 35 kDa (predicted molecular weight: 31 kDa). Preferentially catalyzes the dephosphorylation of 'Ser-5' within the tandem 7 residues repeats in the C-terminal domain (CTD) of the largest RNA polymerase II subunit POLR2A. Negatively regulates RNA polymerase II transcription, possibly by controlling the transition from initiation/capping to processive transcript elongation. Recruited by REST to neuronal genes that contain RE-1 elements, leading to neuronal gene silencing in non-neuronal cells. May contribute to the development of sarcomas. Expression is restricted to non-neuronal tissues. Highest expression in pancreas and lowest in liver. Contains 1 FCP1 homology domain. ab50621 has not yet been referenced specifically in any publications. Publishing research using ab50621? Please let us know so that we can cite the reference in this datasheet. Thank you for submitting your completed questionnaire. Here are some suggestions to help reduce the background: 1. Increase the washes after the primary and secondary by washing 4x 10min 2. Lower the concentration of the secondary by using a 1:10000 dilution 3. Use a 5% BSA solution to block rather than milk. You can use 1% BSA in the antibody diluents if you wish I look forward to hearing if these suggestions prove useful.